FroBunni: Do Hair Vitamins Really Work? Should I take hair vitamins? Well, yes, you can. Anyone can take hair vitamins. The better question is will they give you longer hair. I often avoid answering this question when asked because it takes a bit of time to explain, and why I don't think they're necessary for long hair. A lot of them are actually just marketing and wishful thinking. But before we begin why I don't support them, let's discuss how the diet affects hair. Awhile ago, I talked a little bit about how a good diet can positively influence hair. Hair, skin, and nails are made up of mostly protein. And while optimum protein consumption is necessary for good hair, there are other vitamins and minerals that can support healthy hair development and growth. These vitamins and minerals include vitamin A, vitamin E, panthenol, biotin, and insolitol. You can find these vitamins and minerals in a variety of foods such as eggs, olive oil, whole grains, spinach, carrots, and many more. But it's not just eating these vitamins and minerals that matters most, but getting enough of them. The body prioritizes nutrients; the most vital organs, such as the heart and brain, are first in line to ensure that the body continues to function properly. Hair and nails are a lot lower on the list since they aren't necessary to live. This means that we need to get an optimum amount of nutrients to ensure the hair and nails get enough nutrients to grow long and strong. So, in short, getting a variety of healthful foods in the right amounts will be enough to get an optimum amount of nutrients...in a perfect world. Unfortunately, most of us aren't eating perfectly every day. So we use vitamins to make up for our dietary short comings. So This Means I Should Take a Hair Vitamin? No, I didn't say that. Hair vitamins are rather insufficient compared to most daily multivitamins. Most contain a lot of biotin, and the reality is most us are getting an optimum amount of biotin because it's found in so many different foods. If you aren't getting enough biotin, you're either not eating enough food, or you're eating too much of the same food. Unfortunately, most hair vitamins give the impression that biotin is the most important vitamin for hair growth. It's not. I recommend a healthy diet and a good daily multivitamin. Like I said, it's natural to have some shortcomings in your diet. Most people do. But trying to add a variety of food on your plate is a good place to start. Personally, I recommend getting MyFitnessPal, or any other calorie tracker, to track the amount of nutrients you consume daily; at every meal, try to get protein, carbs, and healthy fats; and take a good multivitamin daily (I'm currently taking SmartyPants). Okay, Thanks...I Still Would Like to Take a Hair Growth Vitamin. Well, I can't stop you, can I? Lucky for you, I decided to research this. 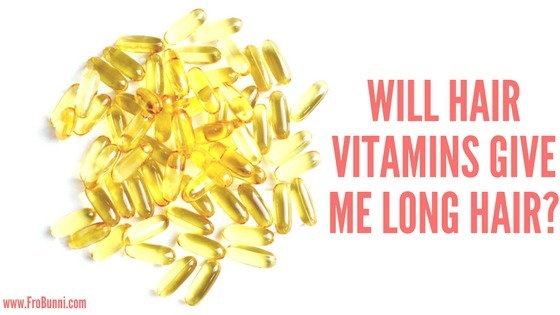 If you want to take a hair vitamin, take one that can also be used as a multivitamin. The best one I saw that compared to an adult women's multivitamin was SugarBear. Like many other hair vitamins, it's expensive, but at least you're getting some vital vitamins and minerals in the process. So, This Will Give Me Long Hair, Right? Maybe. There's no guarantee. If your diet is already pretty good, you may not see much of a difference. Also, if your diet is extremely poor, you may not see much of a difference because the nutrients are being used for more vital organs and bodily functions. On the flip side, you may see increased growth and get the hair of your dreams. But, word of warning. If your diet is lacking, and you stop taking these vitamins, your body may not be able to continue supporting the increased growth, and may shed in response to the drop in nutrients. This is part of the reason why I stress a good diet. Also, it's important to note that hair vitamins can't fix a bad regimen. If your hair care is really poor or even mediocre, the amount of growth you get from the vitamins, may be undone by breakage, damage, and poor hair care practices. Thanks. This was helpful. Anything else I should know? Yeah, a couple more things. While this blog post is informative, at the end of the day, I'm not a medical professional or register dietitian. So if you want to make changes to your diet, consult your doctor or a register dietitian. They can help you create a detailed, comprehensive meal plan specifically for you and your needs. Also, if you have good hair care and diet (be honest with yourself), and you feel your hair growth is slow or you have bald patches, make an appointment with a dermatologist or trichologist who can help identify any underlying medical conditions. One last thing, you can have too many vitamins. Thinking that "more vitamins means faster growth" is pretty faulty. Due to genetics, your hair can only grow so fast, regardless of what you're putting in your body. Also, you can have too much of a good thing. While the body will just get rid of too much biotin through urine, fat soluble vitamins, like Vitamin A, can actually be harmful if over consumed. So follow the directions and don't take more than listed. Yup, that's it. You're now free to make an informed decision about bringing hair vitamins into your regimen.